/In the News /Printing PDFs /Operating Systems / Windows / Windows 10 comes with a PDF Printer Driver! With the release of Windows 10, you can now print directly to PDF without having to install any third party software or drivers. Windows 10 comes packaged with native PDF support that allows users to print any content from any application as a PDF. 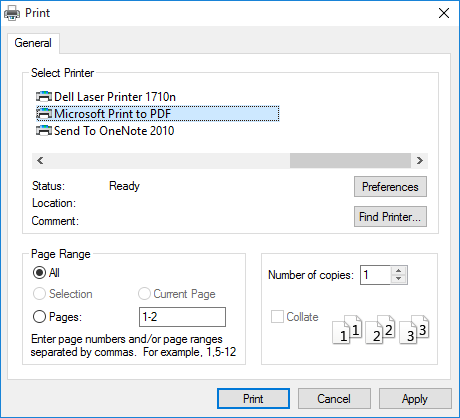 To print anything as a PDF in Windows 10 just print the document as you normally would from the application and then select the “Microsoft Print to PDF” from the printing dialog (see below). Once selected when you click on Print you will be prompted to select the location to save the file and then a PDF document will be created. After the PDF document is created you can use PDF Studio to modify, edit, and/or annotate your PDF document.